Great feedback from Heaton preschool! Hearing positive feedback from teachers participating in the UC CalFresh nutrition education program makes our day! Guess what? Tasting golden raisins and pistachios, had a child who is a very picky eater and mom says it's hard to get her to try new foods. So while tasting pistachios, she liked them so much she told her mom to buy her some. After class mom come back to ask me what we did that day because the child asked for pistachios. Mom said she has never tried to eat them so she was very surprised. When I informed her that we taste foods through our program with teacher Kristi, this week we had golden raisins and pistachios. We sit at small groups and try them to see who likes them and who doesn't. Mom had to thank me because she has a hard time trying to get her to taste anything different. She thought this was so great and was going to the store to buy her child pistachios. How awesome was that! WOW! Thanks for sharing teacher Liz! University of California Cooperative Extention...100 years! In 2014 we'll celebrate our centennial year! Learn more about the ways UC Cooperative Extention delivers healthy food systems, healthy environments, healthy communities and healthy Californians. Check out our recent partnership with Fresno Unified Nutrition Services. 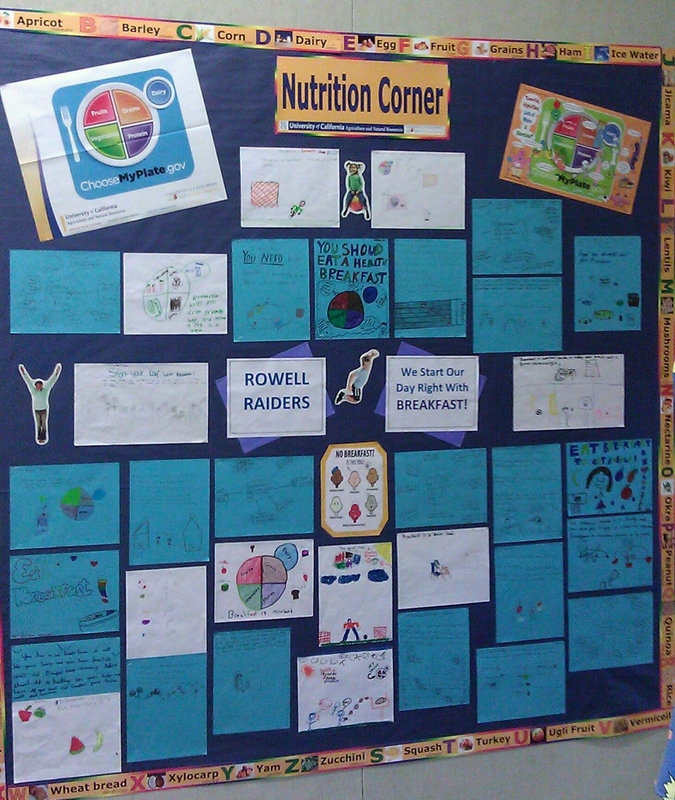 Teachers enrolled in the UC CalFresh Youth Nutrition Education Program are provided with a "nutrition corner" border when they sign up to participate in the program. Setting up a "nutrition corner" in your classroom or a high-traffic area at your school (cafeteria or library) and updating it with students' nutrition work is a great way to spread the word about the importance of eating well and staying physically active. Promoting healthy behaviors creates a positive environment in which students can thrive! Check out Rowell elementary's feature on breakfast this month. Great job Rowell! 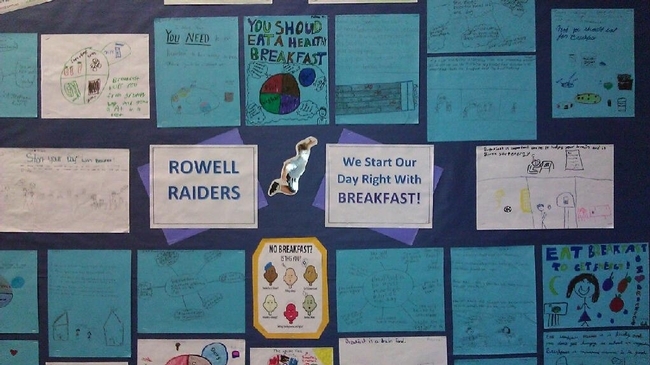 Student work highlights breakfast and MyPlate. "We start our day right with breakfast!" We work with an amazing group of teachers, principals and community partners that help the UC CalFresh Nutrition Education Program reach some of the most impoverished residents in Fresno County. This blog will spotlight our collective efforts to grow healthy families through hands-on, skill-building nutrition education. Recognizing that healthy changes require not only knowledge gain but healthy environmental supports, we'll also feature best-practices for creating an environment and culture that support good nutrition and regular physical activity.